You know that awesome feeling you get when you go through your wardrobe, clear out the things you don't wear anymore, and take a big bag of clothes to the local charity shop? Well, I'm about to make it not such a nice feeling anymore. 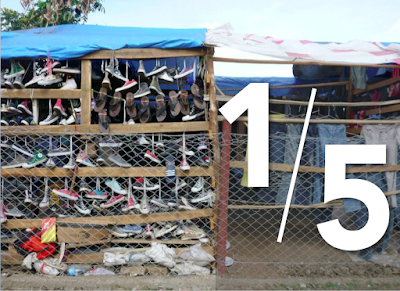 Only 1/3 to 1/5 of all clothing gets resold in the country where it was donated because we are donating way too many clothes. And all the excess must be dealt with at the cost of the charity stores themselves. Some of the excess gets turned into rags, insulation or sofa-stuffing (excellent recycling! ), some of it gets thrown out altogether because it's in such poor condition, while the rest gets bundled up and sent to developing countries. Many countries have a bustling trade in secondhand Western clothing. The photo I've included here was taken on my travels through Tanzania in 2012, where the secondhand market I visited was about the size of a football field and filled with used western clothing at super cheap prices. Aside from the fact that many of the goods were meant to be donated but were confiscated somewhere along the line to be sold (though some charity shops sell bundles to secondhand sellers and it can be nearly impossible to make the distinction), the local textile and apparel industries have been devastated as they simply cannot compete on price with these goods. The proposal is facing intense scrutiny and may not pass (in large part to American interests in keeping the secondhand market booming). But it's certainly enough to make me reconsider my annual wardrobe clean out with fresh eyes. If you have clothes sitting in your wardrobe that you're needing to clear out, why not participate in a clothes swap instead? You can organise one with your friends, colleagues or other social groups, or find one supported by a local council or organisation. In fact, I'll be presenting at a clothes swap next week for Willoughby Council - if you're in the area, I'd love to see you there! Is the quality high enough that I'd give the item to a friend? Has it been freshly laundered? Is it free from tears, stains, loose buttons? If so, donate with a good conscience. And remember, we can all improve on this issue by reducing the number of new items we buy each year, too. If you're not buying large amounts of clothing, you won't have large amounts to clear out. It's a win-win-win. This was really cool to read and learn about! Thanks! Hey, Your article state lots of information to How to donate second hand clothes online? Before donating clothes what things that anyone should keep in mind? Your article describes it in a very beautiful manner.